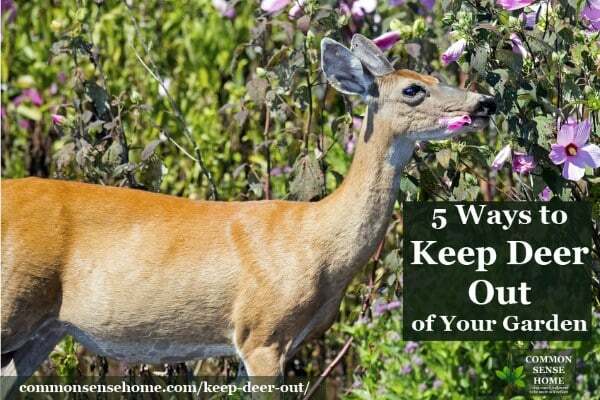 This guide shares 5 tips to on how to keep deer out of your garden, including deer repellent sprays, solid deer repellents, tactics that scare deer away, deer fences and other barriers to deer. (A sturdy fence may work best, but if the local deer population isn't too aggressive, you can keep deer out of the garden without a fence.) After a mild winter and a gentle start to the growing season, our local deer population has increased. I'll also share some tips to help you tell if you have deer damage (versus rabbits), since deer often nibble at dusk, night or dawn when you might not see them. Even though they chew on almost everything in the yard, deer have sensitive taste buds and noses and unpleasant flavors and smells act as a deer deterrent. You can keep deer from eating plants by making the plants less tasty. Egg sprays – Blend together 6 raw eggs and 6 cups water and spray on plants. Deer don't like the sulfur smell of the eggs. Pepper spray – Blend hot pepper or Tabasco sauce into water, strain (if needed) and spray on plants. Predator urine – You can purchase commercial “liquid fence” type products, or encourage your faithful pets to mark their turf around the areas you want protected. Obviously no one wants urine or feces directly on their food, so this works best on non-food plants. People pee – Given that we are predators of a sort (at least those of us who are meat eaters), peeing outside may indeed help deter deer from a specific area. Peppermint extract – If you only have a small area to protect, this might work well for you. Purchase some mint extract (or make your own with excess mint). Mix in a ratio of roughly four parts water to one part extract. Spray on plants that you wish to protect. That cooling menthol taste is less than appealing to deer. Combination sprays – Mixing your eggs and your peppers together will give deer a double whammy. Other recipes include sour milk, onion tops, dish soap, vinegar, clove oil, fish emulsion – if it tastes nasty to you, odds are the deer may not care for it, either. Spray on deer repellents should be reapplied after rains, or every one to two weeks to keep deer out. Rotating your deer deterrent sprays is also a good idea, as deer have been known to develop a taste for spicy food. Hair from people or predators – My husband cuts the boys' hair at home, so I've started placing the trimmings around the garden. Specifically, I tuck the hair around the tops of the raspberries. There the raspberry thorns will catch and hold the hair for a bit. I've been applying the hair from the kitties' grooming brushes there, too. 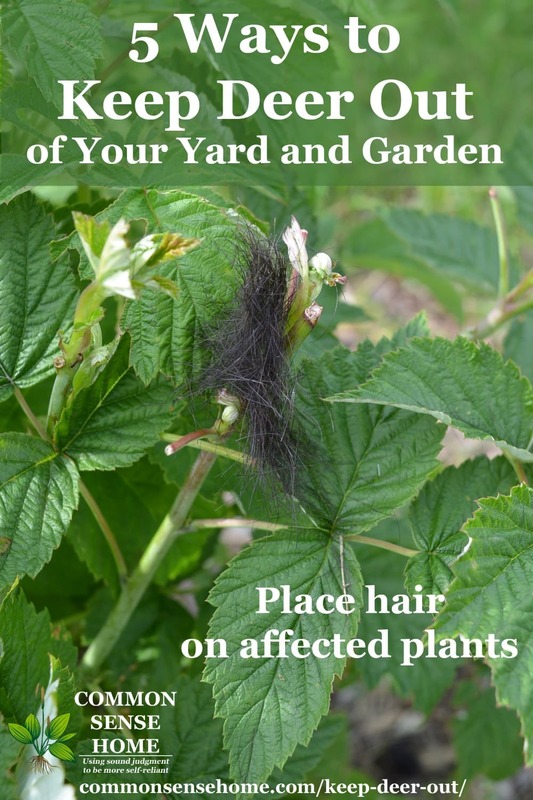 You can ask for hair clippings at your local salon if you don't have your own available to help keep deer away from your plants. Bloodmeal – Sprinkled around plants, bloodmeal gives off an unpleasant odor that acts as a deer repellent. Ivory soap – Many people recommend using soap to keep deer out of your garden. Unfortunately, although it's been recommended for ages, placing bars of soap in socks around the perimeter of your garden is probably one of the least effective methods. You can try it, but I wouldn't rely on it for full protection. Random lights, noises and water sprays can scare deer away from your garden. We're using a variety of strategies around the yard. Some are better suited for urban or rural settings – don't have your neighbors calling the cops just because you're chasing off deer. Motion activated lights or sprinklers to scare deer – We put a solar powered motion light out near the corner of the swales. There are no neighbors nearby to get hit with the spotlight, and it's handy if we need to go and check on that area of the yard at night. Sprinklers may work even better, but I'd rather not waste water or water the garden at night and increase the risk of fungal diseases. Noisemakers – I've placed several plastic grocery bags around the garden, and they seem to be helping. I admit, the changing noises the bags make when the wind catches them even surprise me, and I know that they're there. The beans are growing back, so they seem to be working to scare the deer away. Aluminum pie pans or cans strung together on a wire or string can also startle your nocturnal visitors. Commercial ultrasonic pest repellents are less likely to annoy neighbors while still getting the point across to deer. 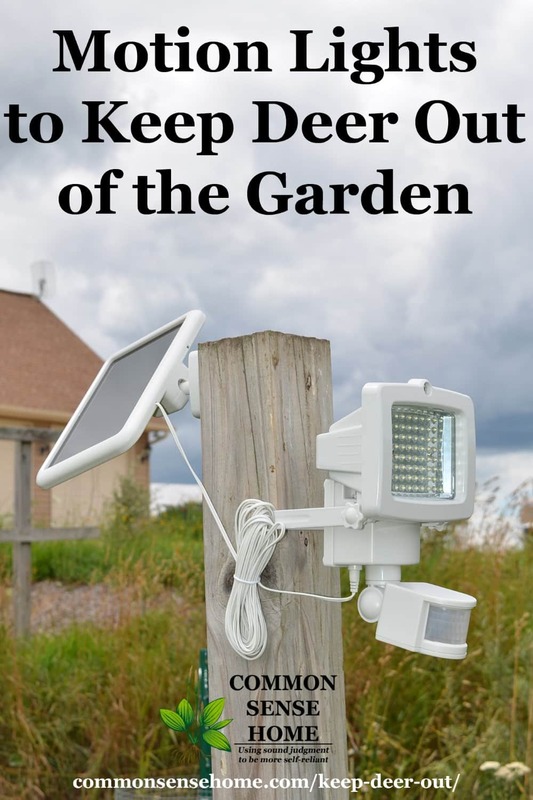 Click here to purchase a Solar Ultrasonic Outdoor Motion Activated Animal Repeller. Dogs – Back on the farm growing up, my dog Mr. Pupper was on patrol every night. The barking was not so great, but we did get a harvest. There are a lot more deer in that area, so a farm dog was a must. Barking alone is not likely to scare the deer for very long – the dog needs access to be able to back up the bark with bite if needed. In our yard, we use 4 foot fences around individual fruit trees that are far from the house. With the fences places about 2 feet out from the trees, the deer can't easily reach the trees. (As my eldest said, “They are not giraffes.”) There's not enough room for them to jump the fence without landing in a tree. We've also used 3-4 foot fences around specific shrubs that seem to be their favorites. While deer might be able to reach over those fences, they don't seem to like putting their heads in a cage. Try plastic deer netting, floating row covers or chicken wire to keep deer out of small beds or specific plants or crops. 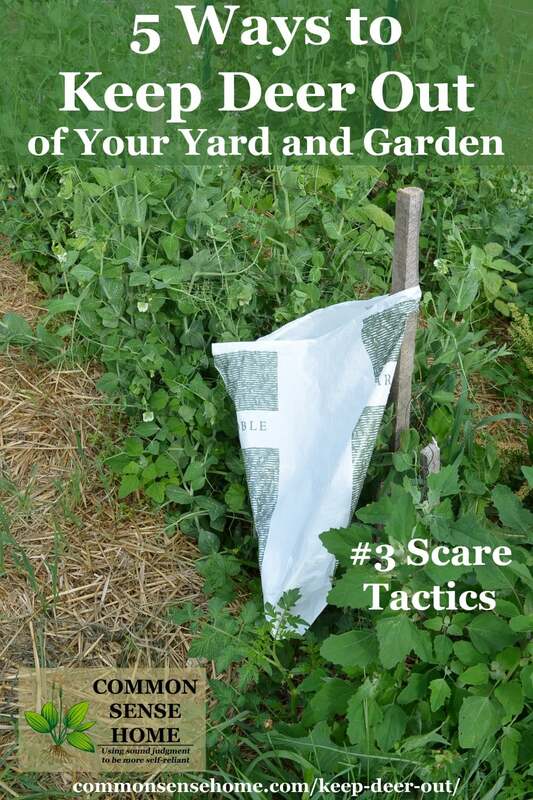 These covers will also help deter other marauding munchers, like birds and other wildlife who want to sample your plants and/or fruit. To use deer netting, gently drape it over the foliage to protect the bulk of the plant. You can also build a box frame over smaller plant. My brother has a chicken wire cage topped with bird netting to protect his beautiful blueberry patch. Without protection, he'd be unlikely to get any crop at all. Use a hoop frame or secure the edges of your row covers to keep them from blowing away. Does fishing line keep deer out of the garden? Fishing line can keep deer out, if you use it correctly. You can get creative and combine different techniques. For instance, pair fishing line with empty cans on top of buckets as demonstrated in the video below. The deer bump into the fishing line, knocking the cans off the buckets, which scares them away from the garden. We've been using different deer deterrents for different parts of the garden and yard, and the crops that were “sampled” earlier in the season are recovering. Now that I know the deer are getting bolder, I'll be keeping a closer watch and taking action accordingly. 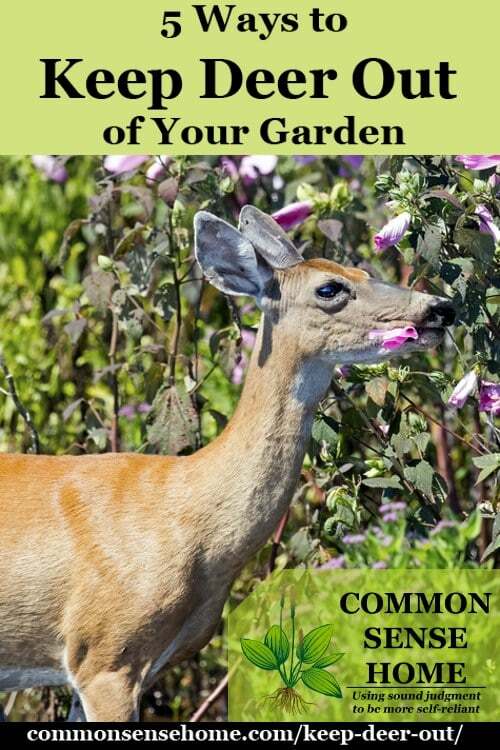 Deer Signs – How do I know deer are eating my plants? Rabbits have munched our garden in the past. I've warded them off with garlic and herbs, which have worked pretty well. I knew it wasn't a rabbit problem this year because it was the tops of plants that were chewed off. Peas, beans, raspberries, jostaberries, fruit trees – all had shaved tops or one side of the trellis missing leaves. Hoof print are difficult to see in mulch or grass, but soft garden soil can give a nice, clear imprint. 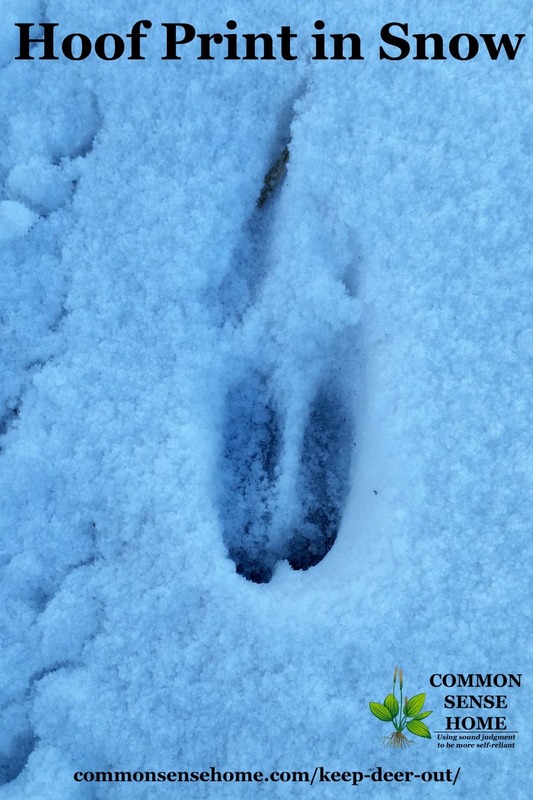 Deer have a cloven hoof. A clear print will resemble two half circles. Often just the tips will push in on firmer ground. My deer thoughtfully fertilized the lawn on the way out of the garden, so I was able to get a nice fresh photo of deer droppings. 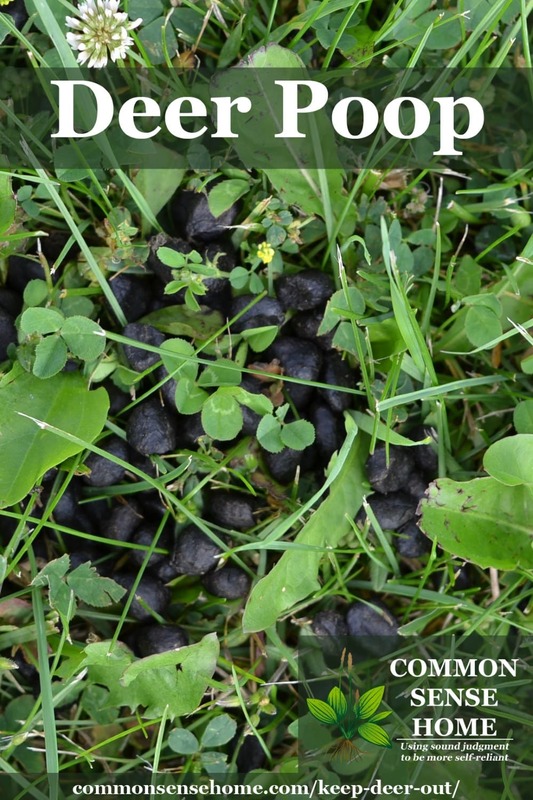 If you're not sure what deer dropping look like, they resemble rabbit droppings, only bigger. They are piles of individual marble sized poop nuggets. 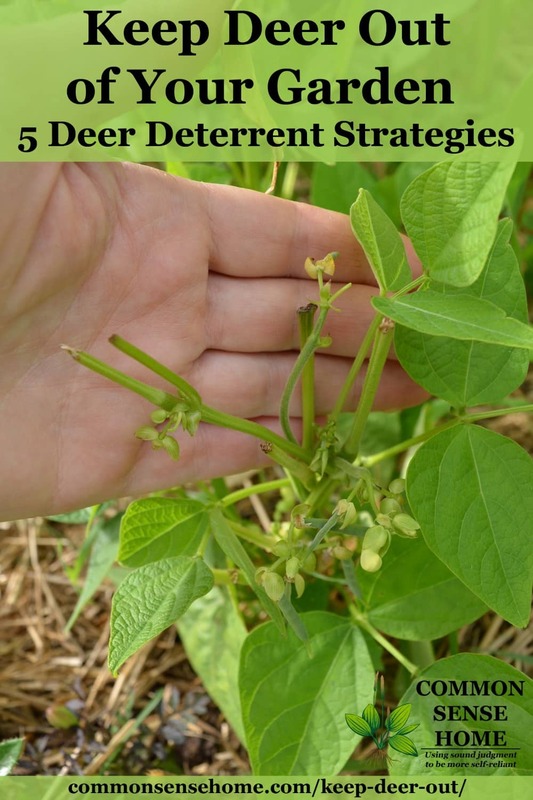 Did I miss any deer deterrent tips that have worked for you in your garden? Please leave a comment to share your experience. Originally published in 2016, updated in 2018. Right now, I don’t have much of a garden. I have deer that come and eat the windfall apples, but that will have to change when I start harvesting all of the apples for myself. they were pretty inexpensive from Oriental trading rather than Amazon, which were really expensive! You do have to put them together, but that isn’t hard at all. These are two of my ideas. My Father-In-Law used blood meal for keeping the deer at bay. It really worked. He had a farm and it kept them from the corn, melons and tomatoes pretty well. I like the peanut butter on the tinfoil. Good way to get the point across. Sounds like you’ve found a good combination of deterrents. I wouldn’t exactly call them inexpensive. $30 per 4 foot long 2 foot tall row could add up pretty quickly, but if you had a small garden with everything planted in skinny rows, they could work. We use Ag panels from the farm supply store. As long as we don’t make the fencing more than one Ag panel wide the deer see it as a trap and don’t jump in. We have a lot of rabbits too so wired chicken wire along the base of the panels. For the flower beds and smaller plants in the yard I bought garlic clips from Gardner Supply. You just punch a hole in it and clip it on your plant. Deer apparently don’t like garlic. Interesting. I’ve never heard of garlic clips. Thanks for sharing your tips. We have a 7 foot deer fence and feed carrots from our deck. They could jump the fence if they want to, but their carrot supply would be cut off. When I lived in Eastern Washington I used human hair, but in south western Oregon they hair didn’t deter them. I guess it is a game of trial and error depending on the deer where you live. Here we have both white tail and black tail, but thy are small. “They are not giraffes.” Haha that’s true, but we did spot the mule deer standing on their back legs to eat the leaves off the smaller, fenced trees in our backyard. Thanks for the tips; we will be planting some fruit trees next month and the deer are abundant and fearless around our place. I don’t think I can keep them from eating the low hanging fruit, but we may be able to use some of these techniques to keep them from hurting the trees until they get bigger. Yeah, they can certainly be determined. We only deal with whitetails here. I’m sure the mule deer are even worse. Can you shoot the deer from your bedroom window? If so, deer meat for supper. Just make sure the DNR doesn’t catch you if it’s not hunting season.